This little cubby in our living room stood as an eye sore for close to two years piled with storage bins, books, and childhood memories that we didn't want to part with. Living in a small space with little storage, we resigned ourselves to the fact that this was how it had to be and allowed the eyesore to stand unchallenged. After the flu and a few DVR’d episodes of The Nate Berkus Show in a row, my creative juices were flowing. I could not let the focal point of my living room be that chaotic storage space any longer; there had to be a better solution. I rearranged everything in our little space and even brought a few boxes back to mother’s basement for temporary storage. The area under the staircase was cleared away of all chaos and ready for a makeover! Pictured is my solution; it is still a work in progress but I could not be happier with our staircase reading nook. My boyfriend and I are both readers and had books scattered everywhere. It was only fitting that we showcase our hobby and make the space conducive to reading. We have definitely outgrown the current bookcase but it works for now (one of my summer goals is to build one). Immediate next steps: throw pillows for lounging with a good book and lighting. Ever since I was a child, I have always loved lying under tables, beds, any type of large furniture really, while reading. This could not be a more perfect adult version of that! The walls: apartment living has me suffering from white wall syndrome as I often mention. This was my cheap, temporary solution for a small space that doesn’t get much up close attention. Thanks! Kids always find the best spots in the house, don't they!! 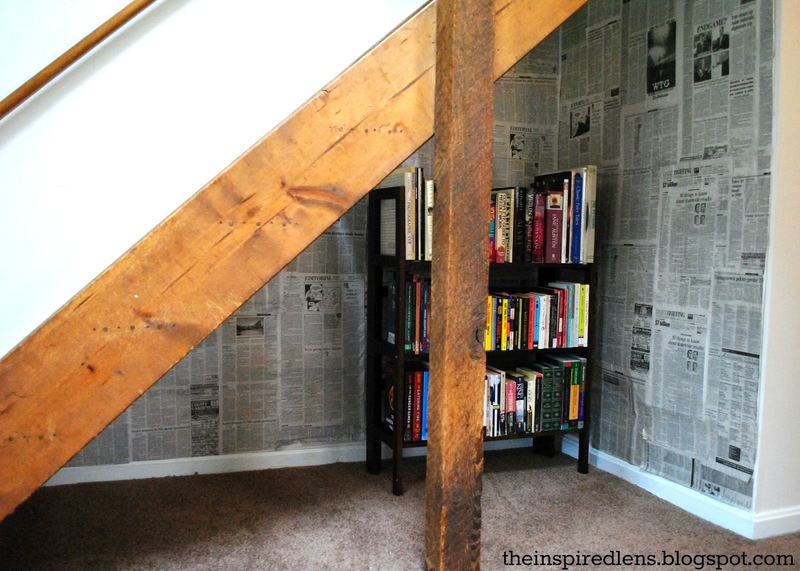 Love this, I also saw this done on the Nate show where he took foreign newspapers and used it as wall paper!!! I am gonna have this in one of my rooms! I would LOVE foreign newspapers!! I'm going to have to keep that in mind for my future dream trip to Europe!! Thanks!